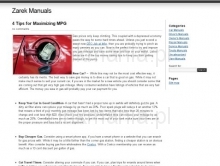 ReklamaGoal of zarekmanuals.com is to provide full services manuals and owner's manuals in pdf format. Our database encompasses audio service manuals, dvd service manuals, video service manuals, vcr service manuals, tv service manuals, camcorder service manuals and many more. Service manuals include disassembly instructions, schematic diagrams, block diagrams, part lists and other sufficient data for repair.